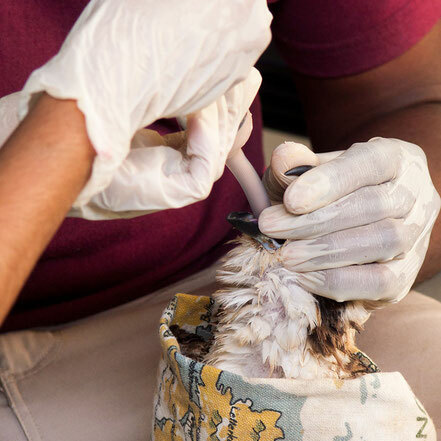 The trained professionals at ECWC specialise in the rescue and rehabilitation of wild animals with the purpose of returning all releasable, native species into protected, appropriate areas of the wild. To date, we have assisted over 700 animals around the country at our own cost. Any animal that is non-releasable will permanently reside at the centre and if appropriate, become an ‘animal ambassador’ in our education programme. Our staff are trained in the IWRC's Basic Wildlife Rehabilitation, Pain and Wound Management, Oiled Wildlife Response and Dolphin Stranding. In order to give the best possible care, we strive to continually update our training as well as that of the volunteers and other interested groups. Feeding a burned osprey with pulped fish. Often the first task in animal rehabilitation is to get food into them. Many traumatized animals will stop eating and can then become gradually weaker and die. Not all animals we help are injured, some just need to to be moved to a more suitable area. 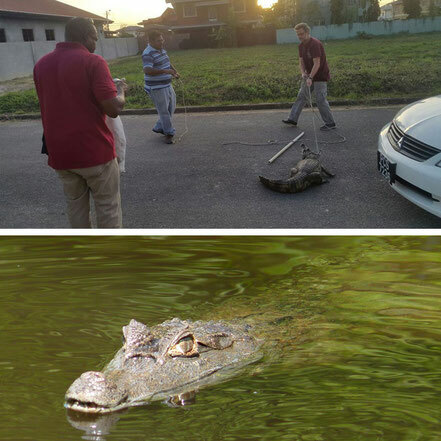 This 5ft pregnant caiman now enjoys more relaxed surroundings in a large protected pond system. 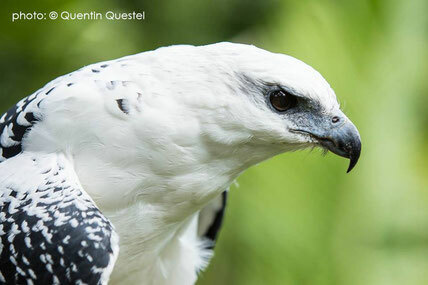 One of our most popular wildlife ambassadors is our white hawk, scientific name (Pseudastur albicollis). This story is one of love gone wrong. Someone was so captivated by the beauty of this bird that he resorted to shooting it on it's wing to keep it. The bird survived the shooting and was kept in a tiny box as the shooter had no idea to do with his "prize". A neighbour seeing the condition of the bird, took it from him and put it into a Kennel next to a PitBull. His diet consisted of chicken liver. The ECWC was called in to collect the bird when the lady was travelling and had no one to care for the bird. When we got the hawk, most of all of his primary feathers were broken and secondary feathers were in bad condition. X-rays revealed that the wing was broken in four places. However the time had been so long between injury and us getting it that fixing the bones was not possible. We knew that he could not go back into the wild as he could not fly so could become a wildlife educational ambassador. At the Centre he was rehabilitated for two years and molted completely before he was presented to the public. We were able to feed him properly (at least 6 mice per day) and provided him with proper housing. His calm disposition even when stressed made him easy to glove train and our volunteers had a wonderful learning experience doing so. Today Oreo is a crowd favourite and has made us proud for our decision to keep him. In early August 2015 a vet brought in a juvenile brown pelican to the ECWC. There were no apparent injuries and it was found standing in her mother's garage quite some distance from the shore. Definitely lost his way! The pelican however refused to eat on his own and this was a cause for concern. He had to be force fed fish three times a day. At first he was lethargic and hardly moved his wings. After a couple days in intensive care he was moved to an outdoor enclosure with more space. Hand feeding continued for one week then the turning point occurred where he charged the door and snapped for food. He then began self feeding, even learning to catch food tossed into the air. Wonderful, but could this bird fly? Our visiting veterinarian checked him out and we came to the conclusion that all he would need is space to fly. He had to prove himself to be releasable. We quickly converted a semi finished enclosure into a flight cage for him so that he could exercise his massive wings. And exercise he did. He flew and flapped and plunged into this pool. The final test was his ability to feed himself by catching live fish. The live fish was placed into his pool and he responded beautifully, jumping in and scooping up the live fish. On the 31st of August 2015 our rehabbed pelican called PelliToo by the volunteers, was taken to Orange Valley Bay to be released. More than ten car loads of people made the trip from the centre to the shore for the release. Several families with bright eyed and excitable children all happy for the unique experience. Upon this release he flew beautifully and made a nice lap before touching down gracefully on the calm waters. 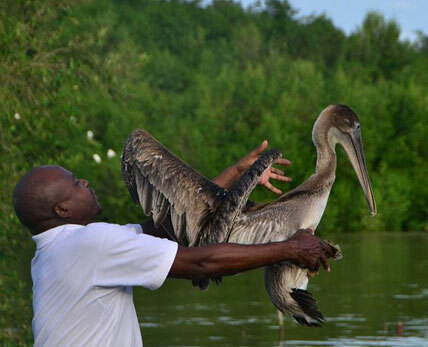 For many it was their first release, for us it was our second pelican and that wonderful feeling never gets old. Much thanks to all who supported our efforts in any way, without our supporters and friends this would not have been possible.